One of the main ways by which the Obama administration was to heal the planet, cool down the climate, and lower rising sea levels while increasing America's energy independence, reducing its carbon footprint, and dragging it out of the economic recession was through the creation of millions of well-paid, abundant, stable, unionized (with full benefits), healthy, environmentally beneficial, and geographically dispersed "green jobs." After all, as visionaries ranging from Anthony Van Jones to the staffers of the United Nations Environment Program have long argued, nature offers us renewable energy in abundance because the sun shines, the wind blows, the tides roll, and we live on a molten rock. Only private-sector greed, stupidity, inertia, and vested interest in old-fashioned ways blocked our road to ecotopia. From Germany and Spain to California and Texas, "constructive government partnerships" fortunately channeled much green (typically a few hundred thousand dollars per job "created or saved") toward green-job proposals. True, minor hurdles such as overturning the laws of physics and economics needed to be overcome, but what could environmental pioneers and elected officials fail to accomplish with access to other people's money? Try as they might, however, none of these pioneers succeeded in converting the Green Job Kool-Aid into an affordable, convenient, and reliable energy drink, and the government's "green venture capitalists" failed to discover profitable free-range, grass-fed unicorn producers. As has been obvious since coal-powered steam engines displaced windmills, a modern economy cannot be built on a foundation of countless little distant, costly, intermittent, unreliable, and low-density power sources. Among other problems, even in some allegedly desirable locations the wind blows only about 10 percent of the time. Wind might be free, but the construction, installation, and maintenance of wind turbines are not. Locations with abundant (yet far from being sufficient or reliable) wind are often frequented by charismatic migratory birds (who are there for the free ride) and far from urban markets, thus mandating both massive increases in transmission and production capacity because the longer electricity travels, the more of it is lost along the way. Giant batteries to store the power produced when it is not needed do not exist, so additional back-up fossil-fueled or hydropowered generation that can be ramped up or shut down quickly also needs to be built or called on. Biofuel crops, for their part, typically require more power to produce than they deliver, cannot be transported through pipelines, and often damage engines designed with fossil fuels in mind. As if all this were not enough, manufacturing the mechanical components of a green economy turned out to be cheaper in places such as coal-powered China, and the recent development of shale gas is proving to be a game changer of historic proportion in energy markets (and is thus fought energetically by anyone with a vested interested in wind, solar, and biomass power generation). Because of such unavoidable realities, in all jurisdictions where substantial amounts of public money were spent to increase wind, biomass, and solar capacity, energy bills have soared, "fuel poverty" has become a permanent fixture of policy debates, and green jobs are increasingly acknowledged to be unsustainable con jobs that will vanish as soon as the bad political power trips that led to their creation come to an end. "In all jurisdictions where substantial amounts of public money were spent to increase wind, biomass, and solar capacity, energy bills have soared, "fuel poverty" has become a permanent fixture of policy debates, and green jobs are increasingly acknowledged to be unsustainable con jobs that will vanish as soon as the bad political power trips that led to their creation come to an end." As the backlash against green snake-oil peddlers mounts, so does the number of intelligent critical discussions of the topic. Among the latest in this genre is a work by the economists and legal scholars Andrew Morriss, William Bogart, Roger Meiners, and Andrew Dorchak, The False Promise of Green Energy. These authors provide an accessible and sufficiently comprehensive survey of the perennial technical problems and uneconomic character of solar- and wind-power generation, biomass-derived fuels, battery-powered cars, and rail mass transit, and they mince no words in describing what can be seen when they lift the green veil under which special interests ‒ corporations, politicians, and environmentalists ‒ have long concealed themselves while securing taxpayer-funded subsidies. They also document how, long before self-described "green visions" came along, market incentives were spontaneously fostering the development of the ever more efficient use of costly inputs in all economic sectors so that very few green bills were left lying on the energy sidewalk in the first place. The book's real value, however, lies in the authors' application of basic political economy concepts to their subject ‒ from opportunity costs and rent seeking to the Bootlegger-and-Baptist framework and the inherent opposition between the maximization of human welfare and the creation of artificial jobs through government fiat. Like other economists before them, they observe that pouring taxed and borrowed money into green-job schemes destroys more jobs than it creates. To their credit, they are blunter than most critics. My favorite one-liners from the book are: "[O]ne man's (bio)fuel is some child's meal" (p. 68); "[S]elective technological optimism in the green jobs literature is so omnipresent that there is almost no bad news anywhere except related to fossil fuels" (p. 97); in the eyes of green visionaries, what makes a job truly "green" is the "inefficient use of labor within a production process" (p. 149); and green-energy proposals typically rely on "bad data used in poor quality models designed with flawed assumptions about economics producing unreliable analysis upon which unsupported recommendations are based" (p. 198). 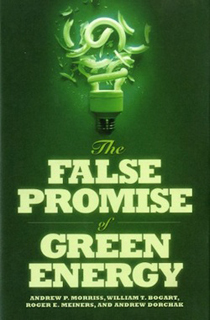 Indeed, the authors argue, the fact that the green-jobs literature "contains so many basic economic errors is not accidental but reveals that it is built on a thinly concealed hostility to market-ordered societies, a hostility that strongly influences its policy recommendations" (p. 124). Their unmistakable conclusion is that "green energy proponents have been peddling an unrealistic vision of energy production and use and are suggesting measures that will require either dramatically increasing the cost of energy or significantly cutting its use" (p. 6). Either of these requirements implies a drastic reduction in standards of living and, in light of currently available technologies, an insurmountable obstacle to the development of the economies in which the world's poorest people live and work. The False Promise of Green Energy is a welcome contribution to more sensible public discussions of energy policy. Although I would normally be suspicious of its capacity to reach a broad audience, perhaps the problems inherent to green jobs have become so visible on domestic energy bills that more people will now be willing to plow through such serious material. Indeed, the book was discussed on a local (Toronto) radio talk show and mentioned to me by some acquaintances at my local dog park while I was preparing this review! Readers of this journal would be well advised to emulate my neighbors and familiarize themselves with this material. * This review was first published in Spring 2012 issue of The Independent Review.